The development of the American southwest from an aboriginal primitive place to civilized place is a relatively recent event. 100 years ago, the Moapa Valley, like much of Nevada, was still unsettled land, sparsely populated with pioneers, ranchers and prospectors in search of a better life out west. The settlement of the Moapa Valley area is no exception to history and our history as an pioneering local enterprise- the history of the Moapa Valley Telephone Company- begins just four generations ago, in the year 1909. The hearty pioneers who established our rural Nevada communities, mostly ranchers and prospectors, just were a different breed. Often, as in the case of our founders, they were simple, hard working, independent-minded folk, with an unstoppable determination to carve a better life out of an inhospitable and arid place. The term ‘salt of the earth’ applies to so many of these early settlers. The Moapa Valley, and much of southern Nevada, was in its infancy as the 20th century dawned. One of the first things that every budding community did at the turn of the century was to establish a link to the rest of the world. Those vital links were the railroads, telegraph, and later, a brand new invention with great promise: telephone service. Thus, with the ever pressing need for our communities to grow and prosper, the local telephone company was established. With the backdrop of the turn of the century in mind, a few of the most stalwart citizens in the area at the time decided that the path towards a better future began with the ability to communicate amongst themselves and with the outside world. As a result, Moapa Valley Telephone Company was incorporated on April 6, 1909, when the Articles of Incorporation were filed with the Lincoln County Clerk. (Shortly thereafter, Clark County was formed out of the larger Lincoln County and today, Moapa Valley is part of Clark County.) The original stockholders’ names read like a “who’s who” of the early Nevada pioneers, including; Samuel H. Wells, M.W. Gibson, Joseph F. Perkins, Brig Whitmore, U.V. Perkins, W.L. Jones, and W.C. Bowman. As a demonstration of how community minded the formation of a local telephone company was at the time, these were just a few of the names appearing on the incorporation document. The early telephone lines consisted of single wires run through the mesquite trees and connected to a ten line Western Electric switchboard with distinctive bells for each line. This magneto switchboard was located in the S.R. Whitehead Store located behind his home, close to where the America First Credit Union office in Overton is located today. Mr. Whitehead’s daughters operated the switchboard. Telephone poles of native cedar, about 15 to 20 feet in length with large, knotty stubs, were hauled in wagons from Sheep Mountain. Wire, three to six feet long crossarms, braces, and insulators were shipped by rail to Moapa. The first lines that went up were single wire, grounded. Not until Boulder Dam power was brought into Moapa Valley in the 1930’s, was it necessary for MVT to change to a modern two wire system. The brand new Moapa Valley Telephone Company serviced an area consisting of St. Thomas, Kaolin, Overton, Logan (now Logandale), Hupton (now Glendale), and Moapa. From the east, the Rio Virgin Telephone Company had a line from Mesquite to Moapa and one on the Moapa Indian Reservation. At this time, Moapa also had a telegraph line operated by the railroad which gave telegraph service to both the Virgin and Moapa Valleys, their only communication access to the outside world at the time. Sometime later, the Rio Virgin Telephone Company sold their lines from Glendale to Moapa, and then their Indian Reservation line, to the Moapa Valley Telephone Company. The connection to Overton was established and for a number of years service was maintained between the two valleys. The connection to St. George, Utah gave access to the rest of the world, but it was almost impossible to communicate long distances without someone having to repeat the message along the route. 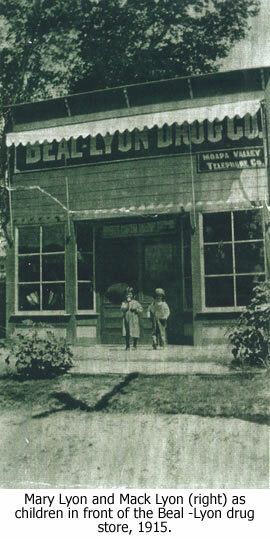 About 1916, the Western Electric switchboard was moved from the Whitehead Store to the Beal-Lyon Drug Store when Warren H. Lyon became the manager of the Telephone Company. The board was placed in the rear of the store and local high school girls were called in to operate it, a common practice in those days. Previously, Mr. Lyon was a businessman in Salt Lake City who moved to Overton to take advantage of the drier climate as a means of dealing with tuberculosis. He was a pharmacist and a mercantilist, a position which, though he could not have known it at the time, placed him at the very birth of the telecommunications business. 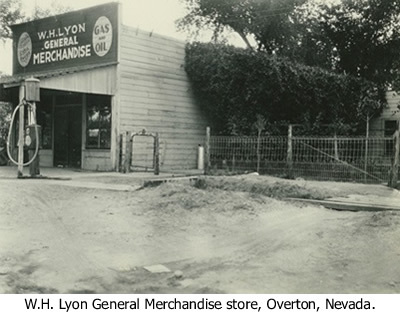 Warren H. Lyon began to acquire stock in the company in January of 1924. A frugal and hard working man, he amassed much of his stock in the company in payment for goods or loans over the years, eventually becoming President of the Moapa Valley Telephone Company. Knowing that a telephone company is of limited value without local power resources, Warren H. Lyon was instrumental in getting electric power from Boulder Dam to the Moapa Valley area. His commitment to both the company and the community was deeply intertwined as evidenced by his tireless efforts to work with others to set up the public school system in the Moapa Valley. 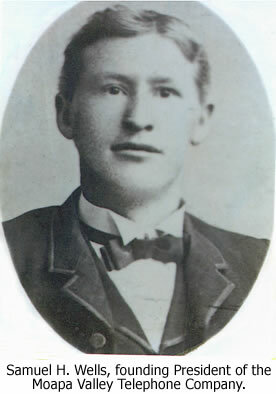 At this time, his son W. Mack Lyon was five years old. Mack remembers trying to take the parts from unused phones to make a ‘system’ of his own. Wires were attached to the magneto generators and playmates were invited to take hold of the wires as he turned the crank. This was a shocking experience for them, to say the least! Where his father suffered through a life of health setbacks, cumulating in a leg amputation caused by the effects of tuberculosis, Mack was, by contrast, a vigorous and hard working man all of his life. By the time he was twelve years old, Mack was going on service calls by himself and patrolling the lines in a horse-drawn buggy. He would take the local railroad motor car to go to Moapa to replace batteries in the telephones. Mack wasn’t the only person that kept the business running smoothly. Early outside plant workers included Crayton Johnson and William Dotson as well. Pragmatic, honest and down to earth like his father, Mack was a little different from his dad in that he was a very curious person and an inveterate tinkerer throughout his entire life. He was also well regarded in his community as a kind and gentle man. He possessed an unbelievable work ethic and simply would not leave any job undone- or half done- if he could avoid it. His wife was known to send one of their children with him on service calls just to make sure that Mack got back home at a decent hour. About this time, the Great Depression gripped the country in economic hardship. Though the country suffered tremendously, little would change in Clark County in terms of the quality of life as a result of the Depression. It was always hard to make a living here in those days and a Great Depression just wasn’t going to make it much harder than it already was at the time. By the same token, people got by, helped each other, and our communities developed a deep sense of resourcefulness that is still evident today. Long distance service was established to Las Vegas in 1934, still using the ten line board. One line became the long distance circuit and the other nine lines continued to serve 8-12 customers each. In 1935, a toll line was built into Las Vegas under the newly-constructed Bell Telephone Company of Nevada lines. On average, less than ten calls a day were placed at that time. Nineteen thirty-eight saw a replacement of the old ten line board with a new, thirty line magneto switchboard. The assets of the company were about $10,000. Operating revenues from toll and local service amounted to $2,500 per annum. In 1941, with World War ll raging overseas, the switchboard was moved to Mack Lyon’s home on Andersen Street in Overton, next door to where the office of Moapa Valley Telephone Company is still located today. Six years later the switchboard was partially replaced with two dial (Kellogg Relaymatic) switchboards, with one located in Overton (50 lines) and the other in Logandale (30 lines). This was the first independent telephone company dial system installed anywhere in the state of Nevada. Moapa Valley was the third area in the state with dial service, the others being Reno (Bell Telephone Company of Nevada) and the government owned Boulder Dam system. With the war over, the Moapa Valley area began to experience a period of growth. At the end of 1947, there were 140 subscribers in the Overton exchange and 60 in the Logandale exchange. There were 15 telephones in Moapa and Glendale that were still being served from the 30 line magneto switchboard. 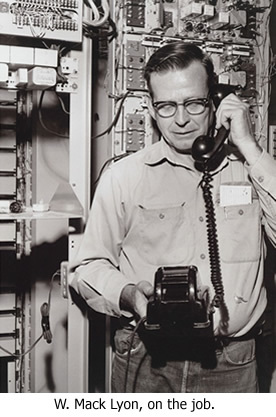 Three trunk circuits from the switchboard sent calls to Las Vegas and all of our subscribers had to call a local operator for long distance service. Our operating revenues had now climbed to $12,000 and plant investment was up to $22,000. The dial equipment continued to serve as the primary switching equipment until 1959, with the old magneto switchboard in Mack’s home still providing long distance and operator services. At this time the switching equipment was consolidated into a new building in Overton and Motorswitch step-by-step equipment was installed. This so-called ‘click and bang’ analog switching system was state of the art network engineering of the day. It took skilled technicians monitoring the system day and night to keep it working perfectly. The older telephone technicians of the day claimed that they could determine the health of the office by listening to these motor switches as they turned and clicked along in correspondence to the digits dialed by the customer. The old open aerial wire (you can still see open aerial wire in use if you look along railroad lines) was reinforced with aerial cable. Private line service became available to Moapa Valley Telephone Customers thanks to the expanded cable plant and switching equipment. These improvements were accomplished with a loan of $105,000 from the Rural Electrification Administration. The REA Loans helped small independent telephone companies get access to long term loans at low interest rates which, in turn, gave these cash strapped companies access to much needed capitol for expansion of service in their communities. The total plant assets increased to $176,000 and annual operating revenues were at $25,000 with 334 stations- customers- in service. Operator and long distance service continued to be provided through the magneto switchboard until 1965 when Direct Distance Dialing (DDD) became available to MVT Customers. The old switchboard was retired with operator service being provided by Central Telephone Company in Las Vegas. In 1965, with the construction of Reid Gardner Plant in Moapa by Nevada Power Company, another exchange with Motorswitch equipment was installed in the Glendale Area (864) and the seven digit dialing plan added the 397 prefix to Overton. The open wire long distance lines were replaced with microwave circuits to the Glendale Exchange. By this time, the total stations served by the Moapa Valley Telephone Company had grown to 499 with annual operating revenues of $56,000 and total plant investment of $379,000. In 1967 the number of company employees increased to three with the addition of Calvert Lyon, who began working with his parents, Dorothy and Mack. Where Warren and Mack had been well suited for pioneering times and getting the company on its feet, Calvert, by contrast, was well suited for these new times requiring innovation and vision. As Calvert learned the business from his parents (and on the job), he grew deep convictions about his role as a member of our community. He turned those convictions into dedicated action, serving in the Air Force as a Colonel, and serving on the town board for many years. With his father’s sense of purpose and determination, it was Calvert who successfully recruited a new doctor to town after several years of not having one. At this time, billing services were contracted with the neighboring Central Telephone Company in Las Vegas. In 1970 annual revenues were reported at $90,000 with over 800 total stations in service. An additional exchange was added in the Upper Muddy (865) in 1972 which included the Warm Springs area and the Moapa River Indian Reservation. Switching equipment in Overton was replaced with an electronically-controlled crosspoint (Siemens CP-240) in 1975. Buried cable became the norm with new additions replacing and reinforcing much of the aerial plant. The Motorswitch equipment which had served Overton-Logandale faithfully for sixteen years was not retired but moved to the Lake Mead/Blue Point Spring area to create a new exchange (394) to accommodate the growth in that area. Calvert Lyon succeeded his father as President and General Manager of the company when Mack and Dorothy retired in 1975. Total employees numbered four at this time. His ability to see where the industry was going helped MVT build a sound financial footing through investments in the cellular market which, in turn, have allowed us to invest in technologies without borrowing to do so. As a result, his vision continues to be a benefit to our MVT customers even today. Digital transmission (PCM) equipment for trunks between exchanges replaced the open wire carrier equipment and greatly improved the transmission quality and reliability of long distance calling. This removed the phrase ‘It sounds like a long distance call’ from our vocabulary forever. In the early 1980s, containerized crossbar switching equipment was purchased from the Central Telephone Company and installed in the Glendale area to replace the Motorswitch and to accommodate the high traffic demands created by the construction of the Nevada Power Company’s Reid Gardner unit #4. An additional unit was installed in Logandale creating the 398 exchange and eliminating the need for all Logandale customers to get their “dial tone” from the 397 exchange in Overton. This relieved the demand for additional cable plant to handle the area’s growth. 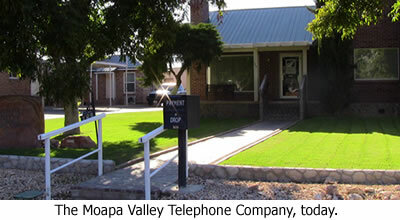 In May of 1985, Moapa Valley Telephone Company became a wholly-owned subsidiary of Moapa Valley Telecommunications, Inc. and entered into a partnership with Rio Virgin Telephone in Mesquite and Centel (now Sprint) in Las Vegas to provide cellular telephone service in Clark County. The conversion from the old analog ‘click and bang’ electromagnetic switching system to the new, silent digital switching platform was as large a change as anything seen by our industry since the invention of the telephone. It would be hard to overstate how great the impact of digital technology has been upon the telecommunications industry on every level. Two years later, in 1987, Moapa Valley Telephone Company entered the world of digital switching equipment with the installations of Northern Telecom DMS 10 switches in the Overton (397) and Lake Mead (394) exchanges. In June of 1988, the Logandale (398), Glendale (394) and Upper Muddy (865) exchanges were converted to Northern Telecom DMS 10’s making Moapa’s switching 100% digital. Digital switching not only ushered in an entirley new way to switch telephone calls, it made possible a range of new capabilities to the network. Custom Calling features such as Call-Waiting, 3-way Calling, Call Forwarding and Speed Calling became available with the new digital switching format. In March of 1989, Moapa Valley Telephone provided its customers with equal access calling to multiple inter-exchange carriers. Now customers could choose their own long distance carrier. The only other companies in Nevada providing the service at this time were Nevada Bell and Centel. Three years later, Moapa Valley Telephone Company implemented SS7 signaling. 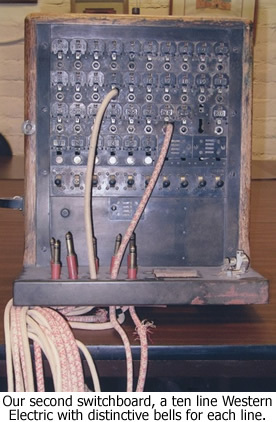 Signal System 7, or ‘SS7’ as it is commonly known, was a revolution in the way telephone companies routed phone calls. It greatly reduced the time that it took to complete a call and allowed for new features such as Caller ID, Selective Call Acceptance and Rejection, Distinctive Ringing and Customer Originated Trace. By this time, our total access lines had grown to total 2,400. 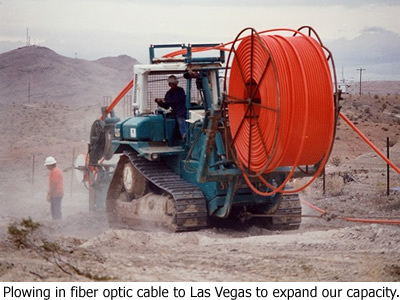 1993 brought fiber optic cable to Moapa Valley Telephone Company with the completion of the installation of fiber cable between the Overton-Logandale-Glendale exchanges which provided for additional circuits and downsizing of the copper PCM system. In May of 1993, Moapa Valley Telephone, Lincoln County Telephone, (Pioche, Nevada) Rio Virgin Telephone, (Mesquite, Nevada) and Centel (Las Vegas, Nevada known today as CenturyLink) formalized an agreement to connect the four companies through fiber optics. The decision to dramatically increase the capacity to transmit data trough a fiber optic cable would have an important and lasting impact upon our ability to deliver a high speed broadband connection to our customers later. During 1995, Calvert’s son Brad Lyon, returned to MVT from work in the Naval Research Lab where he worked as a computer programer. Typical for his family, Brad grew up working for the company, repairing telephones after school. After completing college and a tour at the NRL, Brad came home to take over management of switching and to help launch and develop MVT Internet. Today, Brad is Vice President at MVT, having just completed a term as the President of the Nevada Telephone Association. He currently serves on the State of Nevada Broadband Task Force. In late January of 1996, thirty months after filing, Moapa Valley Telephone Company received the right-of-way permit to construct, operate and maintain a fiber optic cable on BLM property. Construction of Moapa’s portion of the joint project began in February and was completed and operational to Las Vegas in July, replacing the old analog microwave radio. Moapa Valley Telephone completed the other legs of this project a few months later. In August of 1996 Rex Jensen started Comnett Internet and a few months later John Hudrlik, a Moapa Valley Telephone employee, started MVNET, bringing local dial-up Internet access to Moapa Valley. Many customers got a second phone line for their home computer resulting in annual growth rates for access lines between to average 5 and 10 percent through 2001. In July of 1998, Moapa Valley Telephone installed an expensive and proprietary DSL system made by PairGain and teamed with Comnett to provide high speed Internet access to local customers. Once again we beat our larger neighbor to the south, Las Vegas, in offering the newest technology--DSL. The early DSL customers were so pleased with its performance that one stated that she would ‘give up her husband before she gave-up her DSL’. In November 2000, MVT began offering DSL and dial-up Internet as a stand alone provider. Also, during this time we began using a standards-based Alcatel DSL system which allowed us to lower our DSL price while improving and expanding the service capability. Later we purchased MVNET and its 200 dial-up customers from John Hudrlik. MVT has seen phenomenal growth in the number of DSL lines installed and in July of 2005, we installed our third generation of DSL equipment made by Occam Networks. In July of 2004 MVT installed a MetaSwitch VP 3510 telephone switch. The VP 3510 uses IP (Internet Protocol) switching technology or Voice over IP (VoIP). VoIP promises cheaper phone service with yet more features and options. In April of 2006 Calvert Lyon retired as the General Manager of MVT and his brother John Lyon was appointed to the position. Cal worked full time for MVT for nearly 40 years (even more if you count his time as a youth helping his father.) Cal served for 31 years as the General Manager of MVT, longer than either of his predecessors. John Lyon, like the ’good telephone men’ he follows in his position as MVT General Manager, is also right for his times. Along with the quiet determination of his father Mack, and the good vision of his brother Cal, John brings his own competitive spirit to MVT- a necessity for succeeding in the competitive telecommunications environment of today. Moapa Valley Telephone Company continues to be dedicated to providing modern, up-to-date communication services to its customers just as it has for over 100 years. As examples; dial telephone service was available in Moapa Valley eight years before it became available in Las Vegas. Moapa was the first small company to offer equal access and was among the leaders in achieving 100% digital switching and providing CLASS services to our customers. In May 1997, the SS7 Network was expanded to bring calling number information from anywhere in the United Sates. In July of 1998 MVT became one of the first telephone companies in the state to offer DSL. 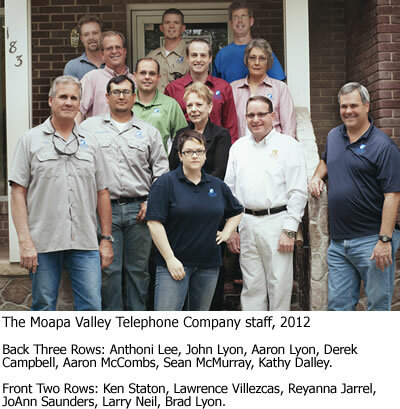 In July of 2004 Moapa Valley Telephone was the first traditional telephone company in the state to install a telephone switch fully capable of Voice over IP services. As our country plunges headlong into the Information Age, Moapa Valley Telephone is an evolving company, one that is constantly looking at ways to develop and implement new forms of communications technology for an information hungry, fast paced world. And, as our second century unfolds, The Moapa Valley Telephone Company is staffed by a team of highly competent professionals with a focused vision for the future. As a result of the hard work and dedication of our forefathers, we are well positioned to deliver the emerging technologies of the future to our customers right here where we live, in Logandale, Moapa, Glendale, and Overton, Nevada.